In the last years of his life, he was dealing with a variety of health issues, and this morning, he died peacefully at UCSF. M.Dung was a very popular disc jockey on KFOG Radio in San Francisco for many years. He had a program called the “Idiot Show” that celebrated the absurdity of rock ‘n’ roll. Rhino Records even released a special CD that paid this tribute to very special show. When the Leukemia Foundation partnered up with KFOG to create the first LOUIE LOUIE Parade in 1988, Dung was the man chosen to be the ringleader /”Grand Louie” of this event. The event, which also featured composer Richard Berry as a special guest, turned to be very successful, and they did it again in 1989. 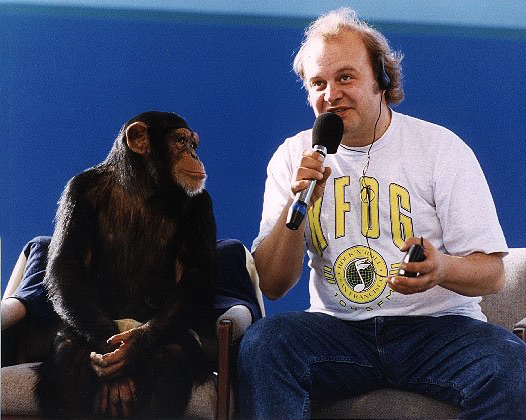 Since that time, Dung has done of lot of other things, eventually leaving KFOG, and launching a special “Idiot Show” podcast for the 21st Century. O-Day, O-Dow, Eye! Justin is joined by radio great M. Dung aka Michael Slavko. 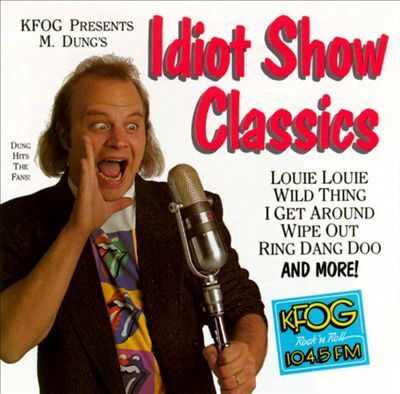 M. Dung first hit the airwaves with his “Idiot Show” in Grand Rapids, MI on WLAV-FM before transplanting himself out on KFOG-FM in San Francisco, CA. Dung earned a massive following in California in the mid ’80s- which grew into legions of followers by the early ’90s- earning him his place in the book as the last truly great radio DJ in the pre-Clear Channel era of radio. 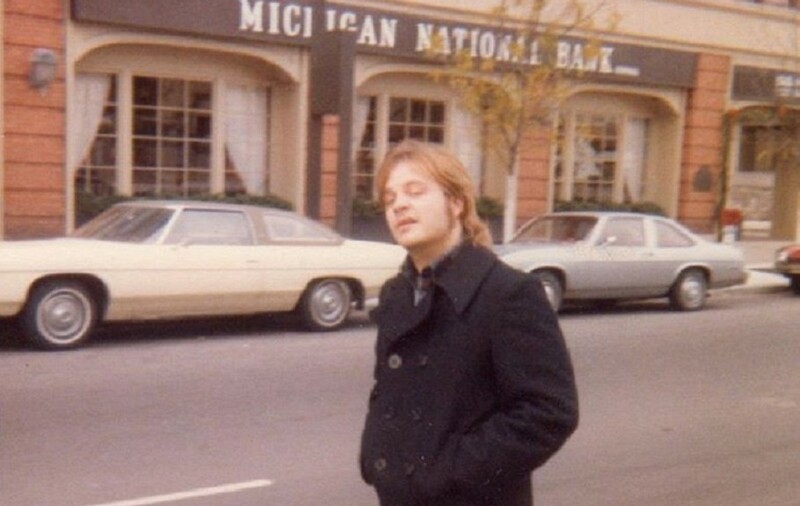 Dung, a Michigan native, talks with Justin about his days on the air in Grand Rapids and San Francisco, his podcast “The Mutant Idiot Show” and how he crafted his signature rock-n-roll wild man persona. Here’s a few photos that Dung shared with his friends on Facebook…. 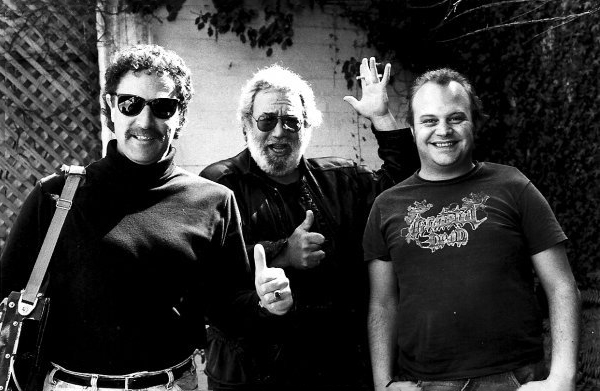 1985 Dead house, San Rafael — with Kenny Wardell, Jerry Garcia and M. Dung. Thank you all so much for loving and supporting Dung over the years. My dad was not the sort of person who expressed his feelings openly, but I know for a fact that in his darkest times you all gave him strength. There was nothing he loved more than sharing his favorite music with the world. If you find yourself feeling sad, play Louie Louie loud enough to piss off your neighbors. And take some comfort in knowing that, right at this very moment, he’s sharing a triple bacon cheeseburger with The King. Rest in peace, my friend. You shall not be forgotten. RIP. You will be sorely missed. Love to your family. Thanks for this tribute; I found it via Google – believe it or not! Sorry to learn of Dung’s going A-way. I was the listener who made the Dung Fly shirts for him. On Sundays my students would call in and Mike would always play their requests. I taped the shows and played them in class the following Friday I even took students to the studio 2 or three times. Great memories. Great music, and a great DJ. And so for the last 22 years I have been a DJ on radio KKUP, 91.5fm and kkup.org on the net. I am Mike the Fly, named after the Dung Fly shirt! My musical format is the same as Dung’s- a mix of doo wop, soul, blues, rockabilly, pop–but no Bobby Vee! I’m 72 years old and I still love being on the radio playing music. Dung’s kind of music. Got to keep the music alive. Your truly, Mike the Fly. I’d just brought up Dung in a conversation about 5 minutes ago. I’m saddened. I was just saying that when I first came out here in 85, I picked up on KFOG right away. I was just saying that the mornings on KFOG, with Dung rolling into Dave Morey were about the best radio I’d ever heard. It was as good as it gets. M.DUNG was my radio listning HIGHLITE & it will never be the same. 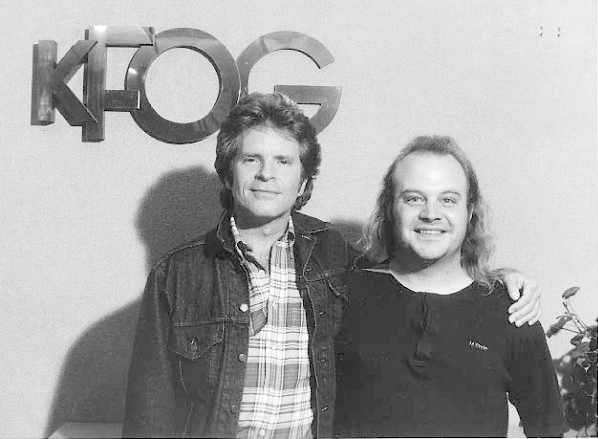 I’ve allway’s loved KFOG for bringing him to me. RIP M.
Sorry to hear of Dung’s passing. I was a huge fan both on the Sunday night show and the morning drive time show. I was a software engineer in the 1980s commuting from Fremont to Alameda, and could time it to catch the end of Dung’s show and the start of 10 @ 10 with Dave Morey. Radio heaven. I met M. Dung once, when he was doing a promo event at the opening of the Raley’s supermarket in Fremont, with my then one-year-old son. Sweltering hot summer day, and Dung was standing out in the sun doing his best to fire up the crowd. I still remember having a chat with him, and feeling that he was a really decent regular guy, despite his legendary status at the top of the ratings in a very tough market. When I was a broadcasting student at San Jose State University back in the early 80’s, I wrote Dung a letter asking for advice. He actually called me instead of writing back which was awesome and gave me some great advice which helped me find work in radio after I graduated from college. Dung, you were a class act and I really appreciate your advice and even more The Idiot Show on KFOG. You were the best rock DJ ever! “Speedies” on pier 9. M. was an ideal DJ who brought thought and history to millions of listeners. I am saddened that the world of rock fans will never be as stimulated as when M. Dung’s voice came from a radio.